The residue testing market, in terms of value, is projected to reach USD 4.41 Billion by 2021, at a CAGR of 6.4% from 2016. Increase in outbreaks of chemical contamination in food processing industries, growth in allergic reactions among consumers, and implementation of stringent food safety regulations are some of the factors driving this market. The key players were identified through secondary sources such as Codex Alimentaurius Commission (CODEX), Centers for Disease Control and Prevention (CDC), The European Federation of National Associations of Measurement, Testing, and Analytical Laboratories (EUROLAB), and Food and Agriculture Organization (FAO), while their market share in respective regions have been determined through both, primary and secondary research. 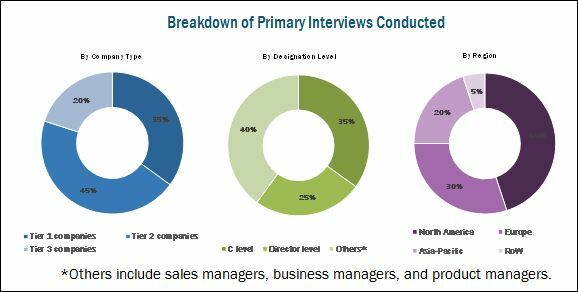 The research methodology includes the study of annual and financial reports of top market players, as well as interviews with industry experts (such as CEOs, VPs, directors, and marketing executives) for key insights (both, quantitative and qualitative) for the residue testing market. This research report categorizes the residue testing market based on type, food tested, technology, and region. With the given market data, MarketsandMarkets offers customizations according to client-specific scientific needs. The residue testing market size is projected to reach USD 4.41 Billion by 2021, at a CAGR of 6.4% from 2016. The market is driven by increasing outbreaks of chemical contamination in foods, growing allergic reactions among children and adults, global movement of organic revolution, implementation of food safety regulations, and international trade of food materials. The global market, based on the residue type, has been segmented into pesticides, toxins, heavy metals, food allergens, and others. The pesticides and the food allergen segments are the fastest-growing segments in residue testing. The pesticide residues have been further segmented into herbicides, fungicides, insecticides, and others (including acaricides, nematicides, rodenticides, fumigants, and disinfectants). The toxins have been subsegmented into mycotoxins such as aflatoxins, ochratoxins, patulin, fusarium toxins, and others (including alkaloids, sterigmatocystin, cyclopiazonic acid, citrinin, and other plant toxins). The heavy metals have been subsegmented into arsenic, cadmium, lead, mercury and others (including chromium, tin, and nickel). The food allergens have been subsegmented into peanut & soy, wheat, milk protein, egg protein, tree nuts, and others (including sulfites, sesame seeds, and celery). 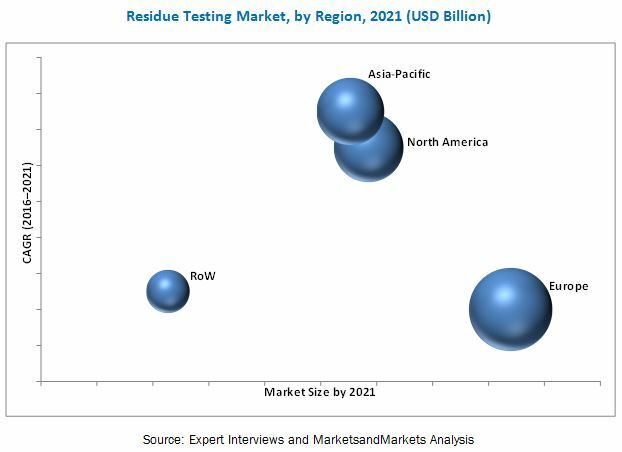 The residue testing market, based on technology has been segmented into chromatography, spectroscopy, immunoassay and other molecular technologies such as PCR and other rapid tests. Residue testing through chromatography technology is the fastest-growing in the residue testing market. Residue testing by food tested has been segmented into meat & poultry, dairy products, processed foods, fruits & vegetables, cereals & grains, nuts, seeds & spice products, and others (including food additives and functional food ingredients). The residue testing market was dominated by the European region in 2015. The recorded food safety issues, stringent policies, which follow the strategy of food safety “from farm to fork” were the key factors that have driven the market in this region. However, as the importance of food safety is rising, it is witnessed that cases of foodborne outbreaks have reduced. Gradually, public awareness is increasing in countries such as Germany, the U.K., France, Poland, and Italy. Asia-Pacific is the fastest-growing region for residue testing due to the increasing number of outbreaks in food residues. Food safety is gaining importance in the region due to incidences of food contamination with chemical residues; for instance, various cases of food allergens, and toxicity were recorded. Growth in this region is driven by various rules & regulations implemented by different countries. Food security standards are becoming increasingly stringent to ensure safer supply of food to individuals in local and foreign countries, which further drives the market. Lack of food control infrastructure and resources, especially in developing countries and lack of awareness about food safety regulations among upcoming food manufacturers are the major constrains in this market. Inappropriate standard of sample collection and lack of standardization of food safety regulations are considered to be challenging factors in the residue testing market. Some of the key players of the residue testing are SGS S.A. (Switzerland), Intertek Group plc. (U.K.), Silliker Inc. (U.S.), Bureau Veritas S.A. (France), and Eurofins Scientific (Luxembourg). The other players who are active in the industry are ALS Limited (Australia), AsureQuality Laboratories (New Zealand), Microbac Laboratories, Inc. (U.S.), and TUV SUD (Germany) in 2015. In May 2014, Eurofins Scientific (Luxembourg) expanded its Auckland microbiology, chemistry, and food-testing laboratory to strengthen its footprint in the Asia-Pacific region. In April 2014, Intertek (U.K.) expanded its global footprint by opening three new food testing laboratories around the world; these laboratories were located in the U.K., the Philippines, and Germany, in order to service its growing global client network. 10.4.1.7 HACCP Regulation in the U.S.
*Details on Business overview, Services offered, Recent developments, SWOT analysis & MnM View might not be captured in case of unlisted companies.